Ready for an amazing spectacle of dance, food, cultural arts, and music this weekend? 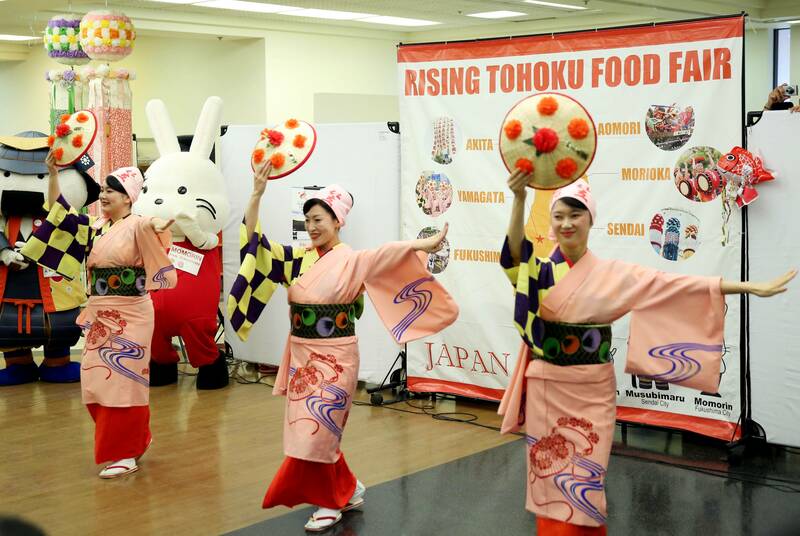 The “Rising Tohoku Food Fair” at Mitsuwa Marketplace in Torrance will offer all that and more. 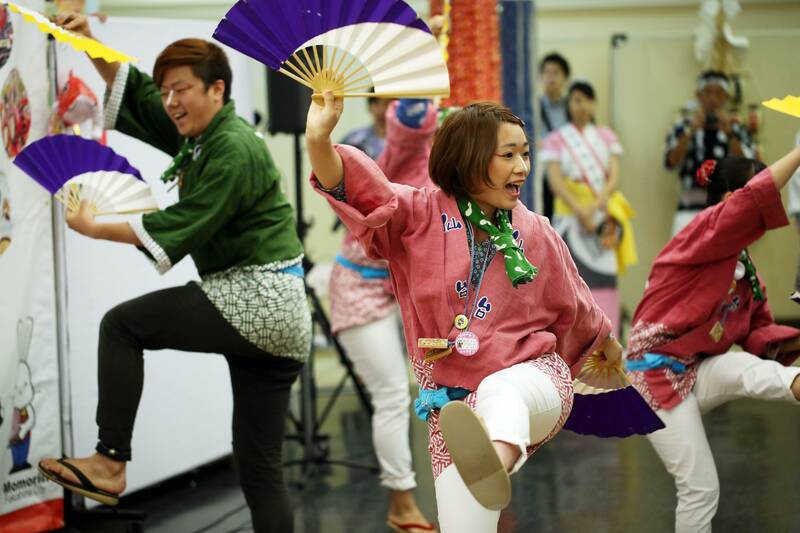 From August 20 through August 23, visitors can enjoy presentations of delicious foods, traditional craft activities, colorful pageantry, and mesmerizing dances from the Japanese region of Tohoku. The hilly and mountainous Tohoku region, the northeastern segment of the largest island in Japan, was heavily damaged in the 2011 earthquake and tsunami. Yet a massive rebuilding effort has brought a robust recovery to the region, which is now re-introducing its diverse food and culture to a global audience. Children and adults alike can enjoy activities such as making origami Samurai armor helmets; writing wishes on tanzaku paper to be hung at the Tanabata Festival in Sendai next year; and taking photo opportunities with local Tohoku city mascots. 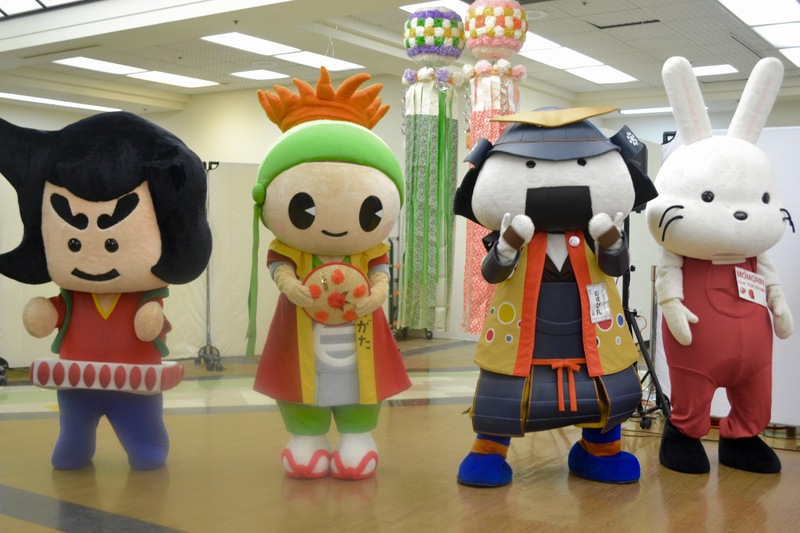 The huggable mascots include Miyagi City’s iconic Musubi-maru, who wears a samurai costume and resembles onigiri (a rice ball); Fukushima City’s Momorin rabbit who represents Fukushima momo (peaches) and ringo (apples); Hanagata Beni-Chan who wears a cherry-patterned kimono and hanagata flower hat; and Nebutan, a pig dressed in the haneto costume worn at Aomori prefecture’s world-renowned Nebuta festival. Other attractions include a Da-te Busho-tai (samurai) performance; Aomori City’s Nebuta orchestra, dances from Sendai City (Suzume), Yamagata City (Hanagasa) and Morioka City (Sansa). 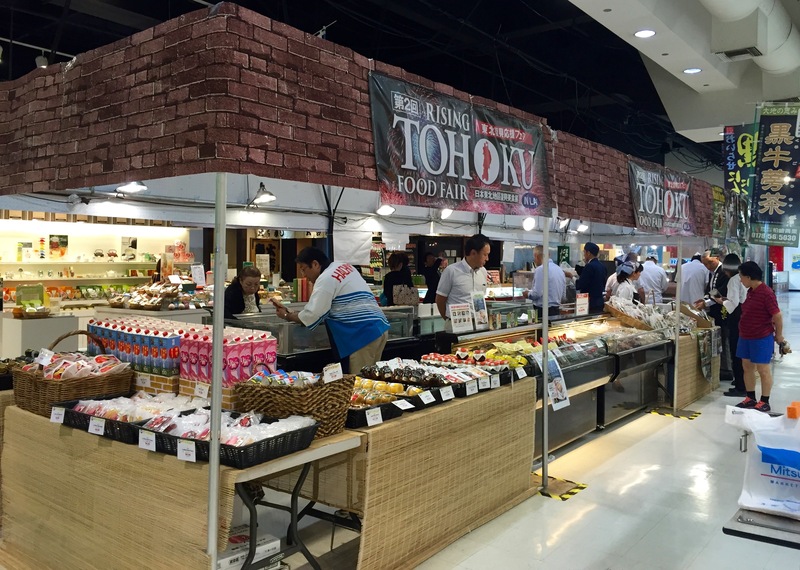 Over in the food section you’ll find an amazing selection of regional specialties, including Wagyu beef from Sendai, Seiken apple juice from Aomori, Odate Kiritanpo (mashed rice) skewers from Akita, fruit juices from Yamagata, and specialty dried fruits from Fukushima. 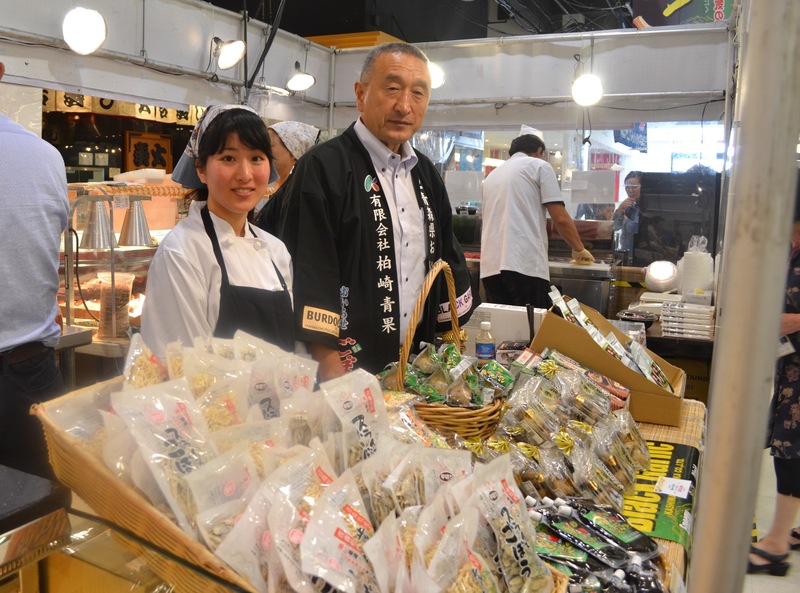 A special Maguro Bowl (tuna sashimi) with an ohba leaf is $8.50, and a Kuroge Wagyu Bento. a sukiyaki and yakiniku (BBQ) combination bento is $18.50. One food highlight that we especially enjoyed was the karinto manju, a Tohoku delicacy kind of like a donut filled with sweet bean curd. 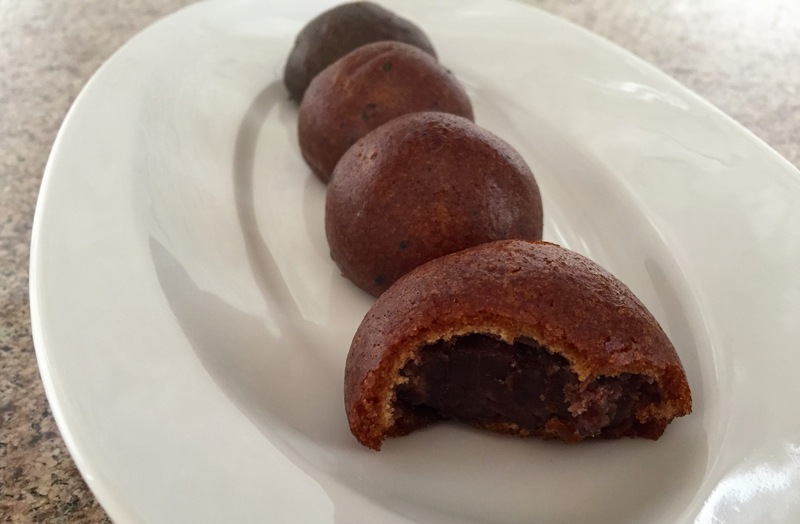 The dough is made with black sugar and the exterior is crispy, sweet, and addicting. 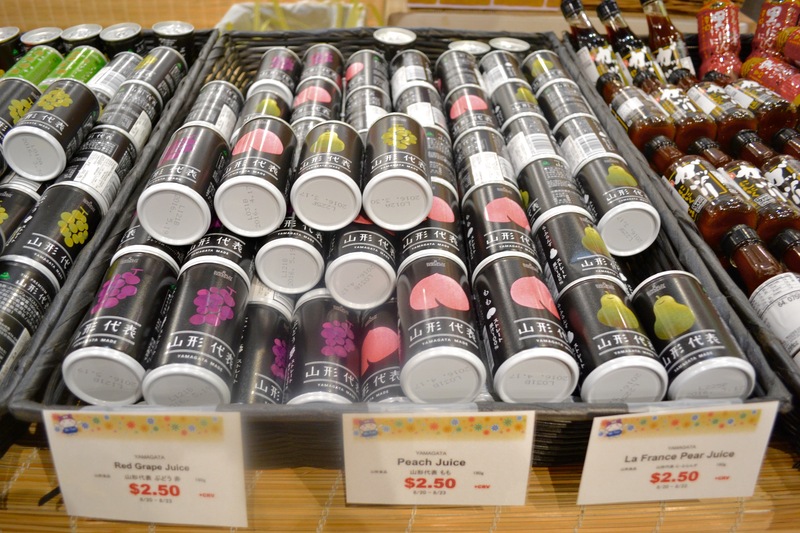 Wash it down with some peach juice from Yamagata, and you’ve got the perfect snack. 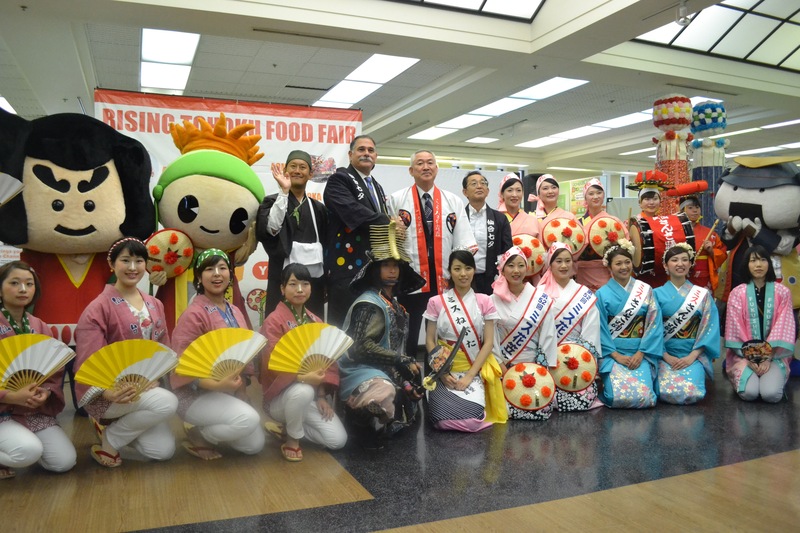 The Mitsuwa Marketplace is located at 21515 S. Western Ave., Torrance, CA. Phone: 310-782-0335. 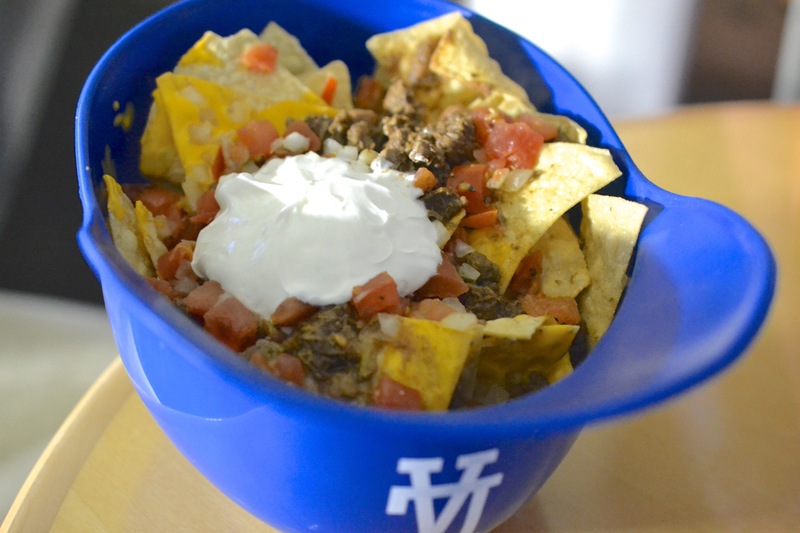 Baseball, hot dogs, and…nachos in a batting helmet? The L.A. Dodgers have some great new food on the menu this season, and our South Bay Dodger fans should plan on hitting the stadium hungry to take advantage of all of the great offerings. Want some amazing barbecue? 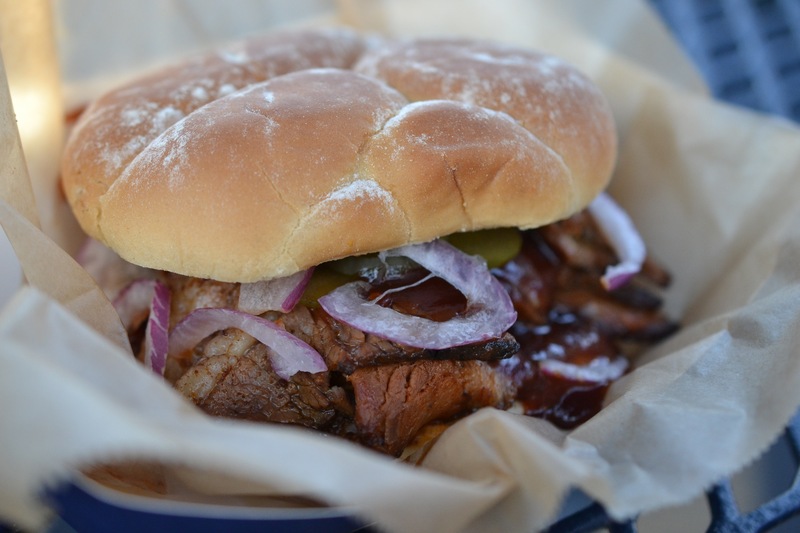 A few steps away at Think Blue BBQ, we flipped for for the slow-cooked BBQ beef brisket sandwich and the street-food style grilled corn, slathered with mayonnaise and spices. This year’s Extreme Dodger Dogs now have company with a new addition, the “L.A. Extreme Bacon Wrapped Dog,” a hot dog wrapped in bacon, topped with grilled peppers and onions, and drizzled with spicy mustard and mayo. And if you’re STILL hungry after all that, you can now get a Major League Nachos Helmet, a 64-ounce helmet filled to the brim with tortilla chips, refried beans, nacho cheese, carne asada, sour cream, and pico de gallo. Hungry yet? Check out our full post on Beyond Dodger Dogs over at Jolly Tomato. Now play ball! And go Blue! On Saturday, October 15, the South Bay Food Fest is coming to the Home Depot Center – which means that more than 30 of the area’s best food trucks and restaurants will be serving up some top-notch eats. You’ll also find multiple stages with live entertainment, eating competitions, and a kids’ zone with a pumpkin patch. Some food trucks we’re looking forward to checking out: Uncle Lau’s Island BBQ, SlapFish, the ShrimpPimp Truck, the White Rabbit Truck, Del’s Lemonade and Refreshments, Bap Pul, Bollywood Bites, Rebel Bite, and more. Presale general admission tickets are $10 each; a family four-pack is available for $30. VIP tickets – which give you entry one hour prior to general admission ticket holders, access to the VIP Lounge in the American Express Stadium Club and a commemorative T-Shirt — are available for $40 apiece. A portion of ticket sales will benefit the Boys and Girls Club of Carson. Also note: If you bring an unwrapped toy for the USMC Reserve’s Toys for Tots drive, you can get a general admission ticket for $8. Tickets are available at The Home Depot Center Box Office, by calling Ticketmaster Charge-by-Phone at (800) 745-3000, online at www.ticketmaster.com or at any Ticketmaster outlet. Suites are available through HDC Premium Seating at 877-604-8777 or premium@homedepotcenter.com. 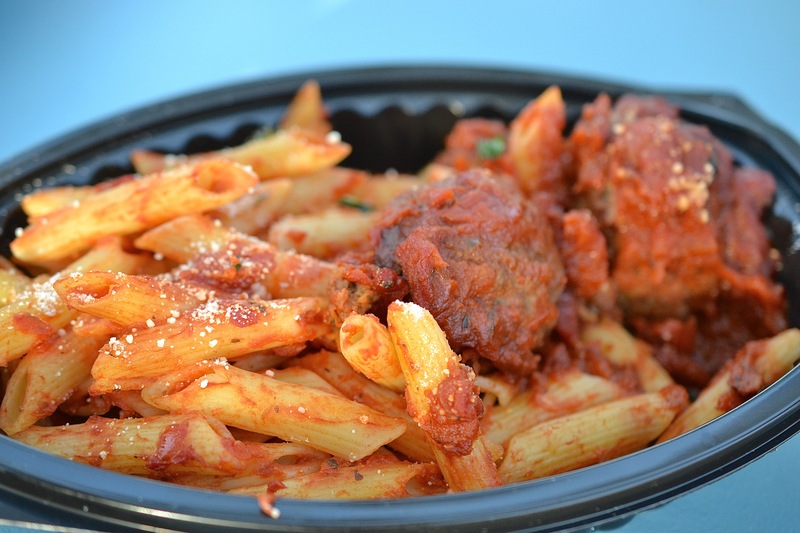 Get ready to chow down!